Could you please tell us about the role of a creative producer in a film? A creative producer on an independent film production has the main job of getting the job done as per the vision of the director. Hence, it's truly a consuming yet satisfying job. One is involved in pretty much every aspect of the film creatively. Given the fact that Shab is a home production, how easy or difficult was it to execute your role? Every project has its share of challenges. Of course, I cannot deny that working in house has its benefits. We all enjoy working together thankfully but that doesn’t mean one takes professional responsibilities casually. In fact the responsibility increases because every aspect is your own so the responsibility is larger. Onir is known to shoot in a very indie style, how challenging it is from a creative point of view? It is far more challenging because it's indie. But that’s what makes it fun. Since Sanjay and Onir have been doing this for awhile and I have always been associated with all the projects in one way or the other. I can safely say that I pride myself in fulfilling the creative needs/demands of my director keeping a limited budget in mind and without compromising on the vision. You have also been a casting director on this film. Tell us a little about the process. How did you end up discovering/casting Ashish Bisht as the lead in Shab? Well the casting for this film was rather interesting. We did the major casting for the peripheral roles from Delhi itself. There were a large number of characters and Onir was very clear that he wanted the look of the film to be very sophisticated. We got some lovely actors to work with us (Andrew Hoffland, Shena Gamat) from the theatre fraternity in Delhi. We also cast a lot of top Delhi male models for our ramp scenes. Ashish was a wonderful find. Onir had asked me to audition him, and after auditioning him a few times, I too felt that Ashish could pull of Azfar’s role very well. When he was cast we made him do many workshops too. 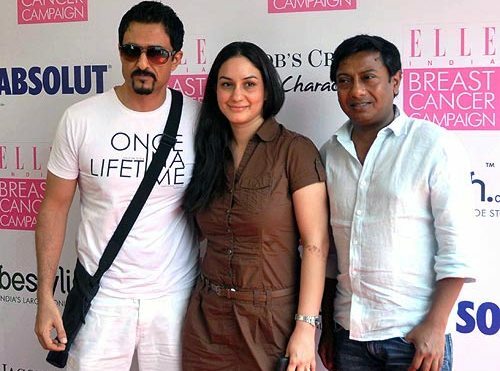 Raveena was always a part of the film but Arpita came on board when Sanjay and Onir met her for Chauranga. Areesz was referred by Sanjay as he had liked his acting and working style in Heroine and when we put him on tape, it was just perfect for Neil. Simon was referred by Onir and then Sanjay met him in Paris and then he came board. Raj Suri and Anika Dhawan were wonderful discoveries. They essayed the role of Rohan and Anu with great ease and confidence. Onir comes across as a very serious filmmaker. How is the general mood on the sets during the shoot? Like any other set, we had our share of fun days and stressful days... Onir works at keeping the atmosphere very warm and democratic. We had a great team and by the end of it we were a big happy family!